G.U.M SUNSTAR 80 soft-picks A disposable innovative interdental brush made entirely out of soft rubber. 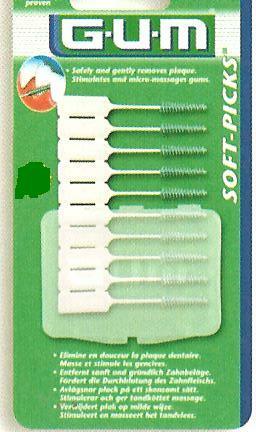 GUM® Soft-Picks™ comfortably slide between teeth to safely remove plaque and food particles. The soft and flexible bristles gently stimulate and micro-massage gums to promote blood circulation and healthy, firm gum tissues. GUM® Soft-Picks™ are clinically proven to help reduce gingivitis. Easy and comfortable to use, GUM® Soft-Picks™ are an excellent alternative to dental floss for non-compliant floss users. Without any metal wire, they are ideal for patients with orthodontic appliances or implants. Convenient travel case for on-the-go use.